My fiance and I both want our dads to officiate the wedding and neither one of us is going to budge easily. We are both close with our dads and fell strongly about our position. How do we decide who to have officiate? 1) Have them share the ceremony, there’s enough important things happening the can split it. 2) Have neither of them do it and have hem both do a reading. Do your Dad’s want to officiate the wedding? Check with them, privately, first to see if they’re interested. If they are then you two (not the dads) need to work out how to compromise on this. Oh, man. The only compromise I see here is to have neither dad officiate. By using the communications and compromise skills you’ll need to have to make a marriage work. This. This is good practice. 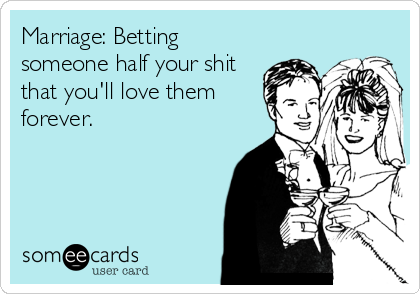 Welcome to marriage & compromise! We actually had 5 priests at our wedding (I have a lot of priest friends who are special to me). Each of them had a role even though only one of them officially signed the certificate. It's do-able. BIL and SIL had 2 priests and a Deacon. Could they each take a role? Can both do it? Each could take separate parts of the ceremony and together pronounce you married. Or some other compromise. If neither will agree to this, then I suggest getting a third party to officiate. At my brother's wedding, he and my now-SIL belonged to different synagogues, and her mother worked for a third one. They worked out a compromise involving religious leaders from all three congregations. It was neat, because all three leaders were really good in different ways (an exceptional cantor from my family's synagogue and really good rabbis from the other two). Don't pick either dad and pick someone else. Oooh I like Option # 2- both doing a reading would be really lovely! And you could have them be the witnesses for the license signing. 2) Hire a professional instead of adding work to the day for both.. I would suggest, first, checking to see if the dads are even interested in officiating because, that could change things drastically (even solve the conflict) if one or both are not comfortable with the role. If both are interested, I would have them share the role. You and FH will need to decide which parts of the ceremony each father would lead. And, perhaps, during the intent segment, the dads could go line by line and maybe your father asks FH if he intends and future F-i-L asks you if you intend, to which you'd both say 'I do', of course! Does that make sense? I hope so and I hope it helps! This sounds cool, but I expect it could potentially lead to legal difficulties. Only one officiant can sign the marriage license, so far as I am aware in all states, and there are typically rules around what must be said and asked to make a marriage legal. Quite likely they could share some of the ceremonial duties, but the actual legally required parts, such as the I dos, would all have to be done by the person signing the license. Both of my older children had my grandfather (who was a preacher) and our church pastor they had grown up with. I have been to many, many wedding with 2 and even 3 pastors. I'd personally have neither do the ceremony and have them both do readings. It honestly isn't worth a). the fight between you two and b). the hurt feelings by whoever doesn't end up officiating. At my fiancé's bros wedding, the bride's uncle/relative did part of the ceremony and then the church's pastor/priest did the communion part. So, if you're dead set, have each do one part? I've definitely heard of multiple pastors. When pointing out legal difficulties, I was talking specifically about the person I quoted's suggestion that two different people go line by line through the intent part and two different people ask them if "they do." That in particular may or may not run afoul of the legal requirements in many states. The B&G would have to do the research themselves. In general, I can see two different pastors working fine throughout most of the ceremony since very little of most modern ceremonies is legally binding. They will just need to do their research and make sure they are complying with the law if they go that route.